Zevrix Solutions announces Deliver Express 2.6.4 a compatibility update to company’s hot folder based file transfer automation solution. Deliver Express supports FTP, SFTP, Amazon S3, WebDAV and other remote and local services. The software offers automatic email notifications, file compression, upload history and more. The app can serve unlimited users on a network. The new version makes Deliver Express a 64-bit app and introduces support for the recently released macOS 10.13 High Sierra. Toronto (ON), Canada — Zevrix Solutions today announces Deliver Express 2.6.4, a compatibility update to the company’s hot folder based file transfer automation solution. Deliver Express supports FTP, SFTP, Amazon S3, WebDAV, AFP and other remote and local services. The software can run absolutely unattended and offers email notifications, delivery to multiple destinations, file compression and encryption, and much more. The new version introduces support for the recently released macOS 10.13 High Sierra and is offered as a free update to licensed users. Deliver Express has also been upgraded to 64-bit architecture, which improves the app’s performance and reduces the likelihood of memory-related errors. Deliver Express can be purchased from Zevrix website as well as from authorized resellers. The license prices are based on the maximum number of allowed destinations and range from US$29.95 to $299.95. The update is free for licensed customers. Trial is also available for download. Deliver Express requires macOS 10.5-10.13. When speaking with Terry Padilla, author of “Latin American Foods,” it is clear early on how very important family is in her life. Miami, FL (USA), March 29th, 2018 — When speaking with Terry Padilla, author of “Latin American Foods,” it is clear early on how very important family is in her life. Her two-year labor of love titled “Latin American Foods” is a children’s book that follows the journey of the Garcia family who were forced to leave their homeland of Puerto Rico due to devastation caused by Hurricanes Irma and Maria. The family relocates to Orlando and as they adjust to the many changes in their lives, the Garcia family embraces their native Latin culture. While growing up in Managua, she witnessed people without food, shelter and clothing. Those images are still fresh in her mind today and provided added inspiration for her book. “Latin American Foods” was illustrated by Tony Mendoza, a Cuban-American artist who Terry had met a few years ago while attending the Coconut Grove Art Festival. She was so impressed by his work that she immediately asked him to illustrate her book with the hope that her words combined with his whimsical illustrations would offer youngsters easy to understand descriptions of some of the dishes that the two of them were all too familiar with as children. As the book was nearing completion, life for many changed dramatically! Hurricanes Irma and Maria hit Florida, the Caribbean and, tragically Puerto Rico. These hurricanes inspired Terry to rewrite the story and incorporate a fictional family, Jose and Maria Garcia and their son Carlos, who owned a bed and breakfast in Puerto Rico. Maria Garcia is originally from Cuba, and loved to cook traditional dishes. Depicting old clothes hanging to dry in the background when referencing Ropa Vieja or including an iron on the Cuban sandwich illustration since it is traditionally pressed with a hot iron are just a few of the images that stimulate the readers’ imagination. Terry remembers the time when she asked Tony to draw a beautiful, colorful rooster with wild feathers and have the rooster painting. While puzzled by the request Tony complied, creating Terry’s favorite illustration that represents a dish she remembers all too well as a child growing up in Nicaragua, Gallo Pinto (rice and beans). She wanted to depict the rooster painting because gallo means rooster and pinto is a spotted rooster. Born and raised in Managua, Nicaragua, Terry moved to Miami as a teen and attended Coral Gables High School. She graduated from the University of Florida’s School of Journalism & Communications earning a bachelor’s degree in Advertising with a minor in Business Administration. Her book, “Latin American Foods” is dedicated to her husband Ivan, a fantastic cook and her father, who was the Secretary of Agriculture in Nicaragua during the 1970s. Terry resides in Miami, Florida with her husband and two children. She previously served on the board of the Epilepsy Foundation of Florida for 10 years and currently volunteers her time and energy with the Day of Caring for Breast Cancer Awareness. Terry is a 12-year Breast Cancer survivor! The book is available for $12.95 paperback and $7.99 Kindle on Amazon and Barnes and Nobles. A portion of the proceeds from the sale of the book will be donated to Day of Caring for Breast Cancer Awareness. You can contact Terry Sendelmann-Padilla at 786-281-3737 or via e-mail at terryinmiami@gmail.com. Follow her on Facebook, Instagram and LinkedIn. In her debut children’s book, “Forever Evergreen,” Kay Roberts tells the compelling story of Red, an adventurous sparrow who dares to leave his home in search of adventure. 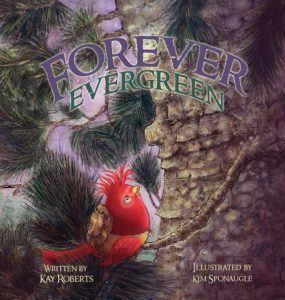 San Antonio, TX (USA), March 29th, 2018 — In her debut children’s book, “Forever Evergreen,” Kay Roberts tells the compelling story of Red, an adventurous sparrow who dares to leave his home in search of adventure. Red finds unexpected allies along the way, as he navigates the Enchanted Forest. However, when trouble befalls him, Red must rely on the help of his new friends if he ever wants to make it back home. When Mother Nature intervenes, the entire forest is affected by her decision. Roberts takes readers on an unforgettable journey, imparting valuable life lessons about forgiveness, hope, and compassion. The book is brought to life with vivid illustrations by KimSponaugle. The storyline began as an oral tale that Roberts first heard from her husband who grew up in an orphanage. “One evening we were talking about childhood memories, and he said he remembered somebody telling him a little story about a bird getting hurt and a fir tree picking him up and caring for him.” After she heard the story, Roberts waited for a while but eventually, she knew she had to put her versiondown on paper. “Forever Evergreen” is now available at Halo Publishing International, Amazon, and Barnes and Noble, Goodreads and Books a Million in Hardcover for $19.98 and as an e-Book for $7.98. 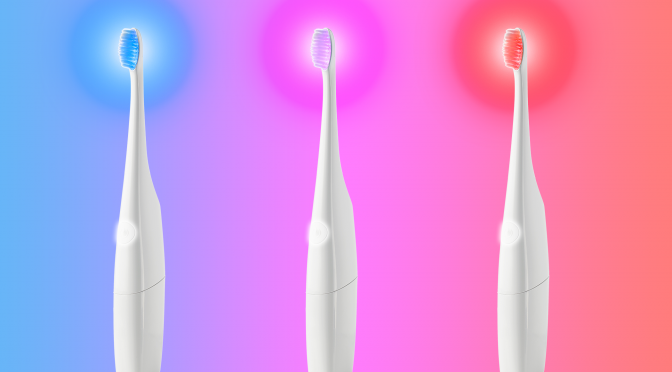 Los Angeles, California, 2018-Mar-26 — /REAL TIME PRESS RELEASE/ — Bristl combines proven science of light therapy with sonic vibration to improve oral care. 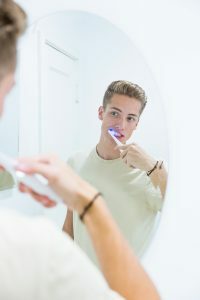 The company also offers a subscription service to replace brush heads, so having the best oral health is also convenient. If you have any questions at all, fee free to give us a call or shoot us an email. Carmel, CA, March 24, 2018 — Now in its fifth year of touring Monterey County, Dance Kids of Monterey County will once again present performances of “Cascanueces: A Folklorico Nutcracker,” in South County schools in November.